When the Church of the Transfiguration, fondly called The Little Church Around the Corner, commissioned William H. Day to design an uptown chapel, the architect obviously took inspiration from Transfiguration’s charming 1848 building on East 29th Street. That structure, designed by F. C. Withers, was described by some as “a holy cucumber vine.” It’s low, country architecture recalling a rural English parish church. 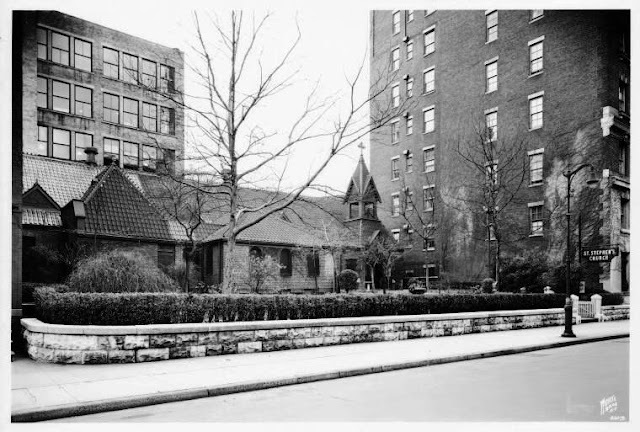 Likewise, while perhaps not quite as picturesque, Day’s Transfiguration Chapel, sitting back on a broad lawn, presented a pastoral image oddly out of place on busy West 69th Street. Completed in 1876, Transfiguration Chapel was intended to serve the church’s parishioners who moved northward, out of the Murray Hill area. The long, low building with its many peaks and gables, its clay tile roof and unassuming bell tower was an obvious extension of the Little Church Around the Corner downtown. The article mentioned that St. Stephen’s Church on 46th Street was interested in the property, valued at around $60,000. St. Stephen’s congregation had outgrown its building; yet there were stumbling blocks to be overcome. The parish of Transfiguration Chapel ardently wished to keep their home and was attempting to raise the money to purchase it from the mother church. In addition, the neighboring Christ Church, two blocks away, was defiantly opposed to the sale to St. Stephen’s. The bickering between the church groups was closely followed by the press for weeks, until at last St. Stephen’s won the right to purchase. 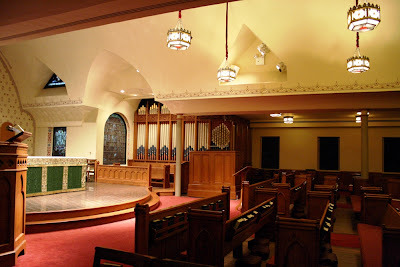 The congregation hired architect J. D. Fouquet to carefully remodel the building with respect to Day’s original design. Their first service was held on October 3, 1897. 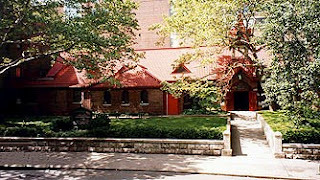 Relations between St. Stephen’s and its neighbor, Christ Church, remained strained and in 1905 Christ Church sued St. Stephen’s for infringing on parish boundaries. The suit was dismissed and the two churches continued in their tense coexistence. Ironically, it was hard times that brought the two groups together in the 1960s. When John D. Rockefeller III built Lincoln Center, he used eminent domain to demolish seventeen residential blocks, displacing over 7000 families. At the same time maintenance costs for the church buildings increased. With decimated congregations, higher overhead and reduced income, the two parishes realized the necessity to merge. In 1975 they became Christ & Saint Stephen’s Church. After nearly a century their uneasy truce became a marriage. Structural deterioration resulted a ceiling collapse in 2004 which necessitated a total demolition of the ceiling. A complete restoration of the interior then ensued. In the process, original 19th Century stenciling was discovered which was restored in sito and replicated elsewhere in the interior. The quaint little church still sits behind its low stone wall like a slice of English countryside dropped among Manhattan high rises; a picturesque and surprising treasure at 129 West 69th Street.